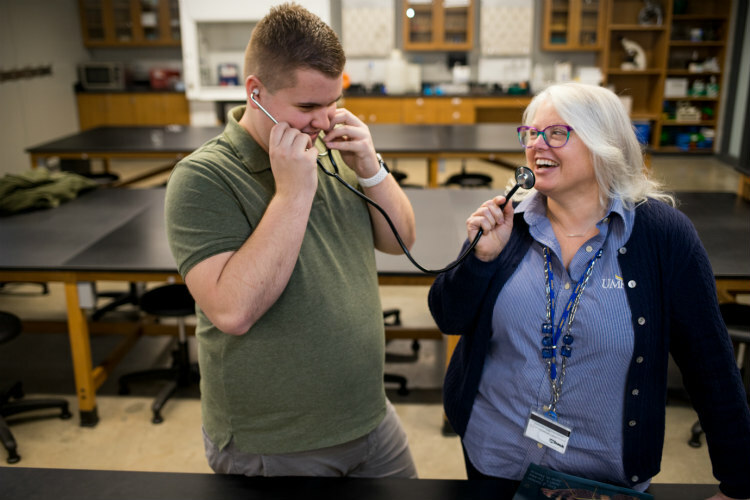 The heart of UMKC is our campus community. With small class sizes, it’s easy to develop faculty-student mentorship teams. And these rich relationships—our Dynamic Duos—are some of our best success stories. Sometimes students start to second guess their career aspirations once they get into rigorous coursework. This is especially true for those going into the medical field. But before throwing in the towel, do what Ethan Granger did and explore how mentorship can give you a fresh perspective on your challenges. 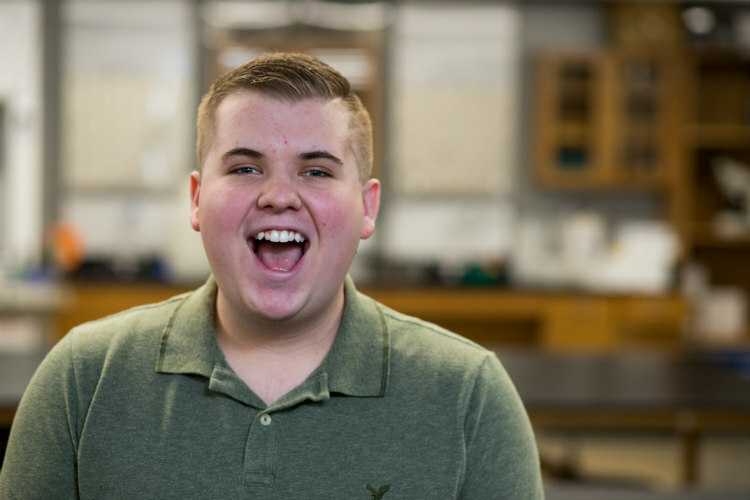 Granger is in his third year of the biology program at UMKC. 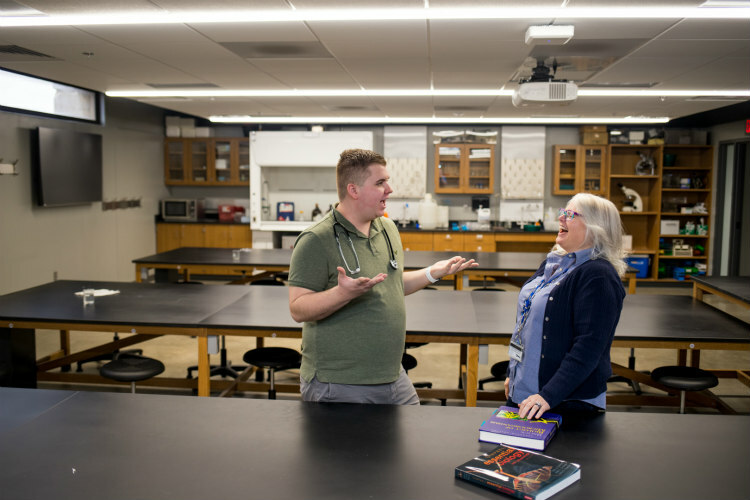 He’s wanted to be a doctor since he was a kid, but he’s been surprised by the incredible focus and hard work his biology degree demands. 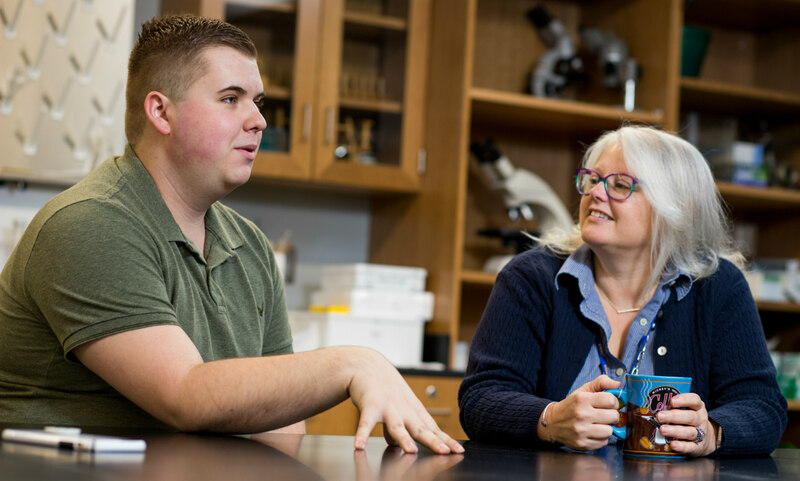 Nevertheless, his experience is made easier because of the perspective and advice from his mentor, Tammy Welchert, associate teaching professor and director of student affairs and academic advising for the school of biology. The two met at Biology Boot Camp, a summer program for incoming freshman biology students. Curiosity piqued, we recently sat down to listen to them both recall how their mentor/friendship developed. “It’s very important to me to learn everyone’s name,” says Welchert. Despite their inauspicious beginning, the two formed a natural connection. Their relationship is relaxed – they are often teasing and laughing – but there is a clear connection of mutual respect. While Welchert is supportive, she is not always a cheerleader. “I’m at the halfway point to graduation and we had to have a very frank conversation at Crow’s Coffee about four months ago,” Granger says. “I had to tell him, if you’re going to pursue medical school then you need to focus,” Welchert says. Welchert’s wake-up call made a difference. “And you’re in scribe position now!” Welchert says. Granger acknowledges that this job, which entails updating doctors’ and practitioners’ notes on patients’ charts, has provided a realistic view of the medical profession. And while he’s comfortable with his leadership experience and grades for med school interviews, he wanted more clinical background. Granger says his scribe experience has done that. Once she knew Granger was willing, Welchert was able to help him get the experience he needed. “We have a recent alum who is a trainer for the scribe company and I called and said, “Hey look for this application that is going to be coming through. I think this is somebody that'll do a good job. “It’s been interesting, because Ethan’s and my relationship is something that a lot of students miss,” Welchert says. While their relationship grew naturally, both agree that students should feel comfortable reaching out to faculty. 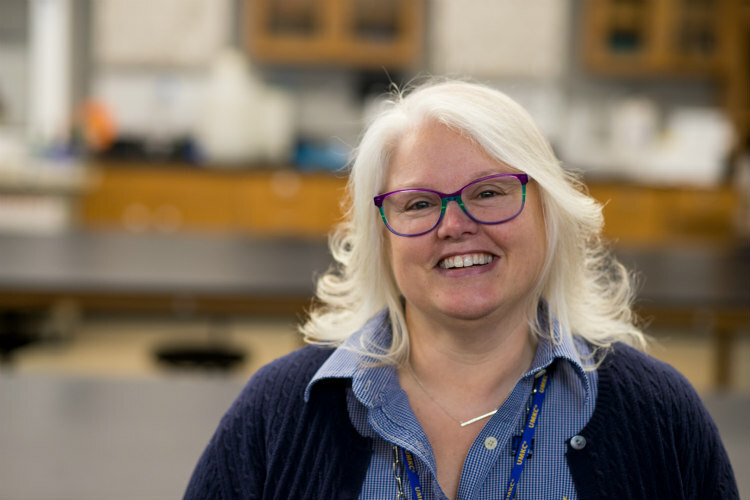 Welchert agrees that faculty is open to forming mentoring relationships. Granger says no one has ever given him the impression that they are not available. “The quotes! Quotes that she tells me three thousand times a day,” says Granger, good-naturedly rolling his eyes. Welchert does not miss the opportunity to remind him of one of her favorites.